Living in a first world country, we naturally expect that when we turn on our taps, clean water will be available for us to drink. Residents of Riverside have unfortunately not been so lucky recently, as their tap water has had a certain “musky” or “earthy” quality. Depending on where you live, and how your water is blended before arriving at your home, the water can even have a strong odour. The water board released a statement explaining that Diamond Valley Lake, one of Riverside’s largest reservoirs, was experiencing an algal bloom. Due to this algal bloom, surface dwelling bacteria have released large quantities of a “nuisance compound” called Geosmin. This chemical is responsible for the “earthy” smell after heavy rainfall, and it is harmless to humans. Experts recommend storing water in the refrigerator for a few hours to try to reduce the smell. Whilst the recent “aesthetic” changes to the water are not a problem for your health, a comprehensive study in 2009 found that Riverside had the 2nd worst water quality in the nation (read more on nbclosangles.com). 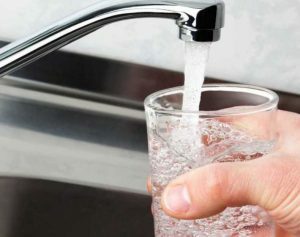 According to the Environmental Working Group’s (EWG) definitive study, Riverside’s water was only behind Pensacola, Florida, in a test looking at levels of over 300 pollutants commonly found in drinking water. The report also states that the water treatment companies spent approximately 19 times more on chemicals to help treat the water than the government does on ensuring the waterways remain unpolluted in the first place. The EWG was concerned that consumers are not getting the full story about what is in their drinking water, and wanted to pressure the government in to setting (and enforcing) regulatory guidelines on safe amounts that can be in our drinking water. Over half the pollutants assessed could be present in any amount, without limit. On the video below, you can see how to check the quality of your tap water for free. Many Riverside residents are now choosing to install home water purification systems for their drinking water to keep themselves safe. (Note: Our plumbing company can help you install your purification system, read more about it).These pass your received water through a series of filters before coming from the faucet. They are especially common in other parts of the world, where tap water is not treated to our (expected) standards, such as India, China or Thailand. They are convenient, economical and safe – having been tested thoroughly in many parts of the world for decades. With concern over the state of our environment, many have been seeking an alternative to bottled water, and using a high quality water purification system is a great solution. If you cannot decide which water filter you should buy, check the great buying guide on http://www.consumerreports.org/cro/water-filters/buying-guide.htm .